It’s all downhill and chill in Warren, Vt.
Sugarbush ski resort offers 111 trails plus many other outdoor activities — and T-shirt weather is coming. This disarmingly quaint town is almost too picture-perfect. “My teeth hurt, it’s so sweet,” one of our out-of-town guests joked as we crossed the covered bridge into the historic center. The blink-and-you’ll-miss-it 19th-century village is home to the stately Pitcher Inn, a classy general store, the meandering Mad River, and a cluster of perfectly maintained homes. It’s laid-back, dog-friendly, and peaceful. You could simply kick back and enjoy a glass of wine and chunks of local Vermont cheese in front of a warming fireplace, soaking up the mountain and river views. But you’d be missing out on some of the best four-season outdoor adventure in the East. Bring your gear; tiny Warren, flanked by the Green Mountains and a stone’s throw from both the Long and Catamount trails, is an outdoor lover’s paradise. 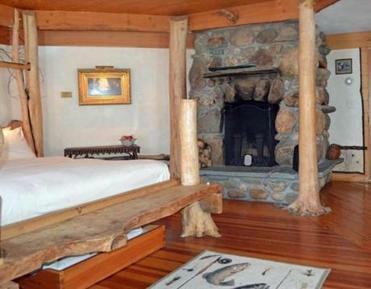 The Trout Room at the Pitcher Inn has a tree-trunk bed frame and river stone fireplace. For luxury with a twist, check out The Pitcher Inn (275 Main St., 808-496-6350, www.pitcherinn.com; $350-$625). Imagine giving free rein to a super-creative architect and team of designers; the result is the whimsical, artsy, Vermont-themed rooms at this elegant inn. We love the Trout Room, with a tree trunk bed frame, ribbed ceiling (to mimic the bottom of a guide boat), river stone fireplace, and original art, including a trio of hand-carved wooden trout. Guests rave about the warmth and friendliness at West Hill House (1496 West Hill Road, 802-496-7162, www.westhillbb.com; $140-$275). The three common rooms, including a library with a pool table and fireplace, are great places to relax after a day playing outdoors. Nine rooms have simple, country decor and modern baths; some have gas fireplaces. You won’t get anything closer or more convenient to the slopes than Clay Brook at Sugarbush (Lincoln Peak, Sugarbush Access Road, 802-583-6822, www.sugarbush.com/clay-brook; in-season rooms start around $240), a luxury, full-service resort with standard rooms to five-bedroom suites, an outdoor pool and hot tubs. Kudos to Tevere Hostel (203 Powderhound Road, 802-496-9222, www.hosteltevere.com; adults $30-$35 a night) for offering fun and economical lodging in Mad River Valley. The recently opened hostel, minutes from Sugarbush ski resort, the Catamount Trail, and the Long Trail, is punctuated with vibrant colors and contemporary art. There’s even a decent restaurant, serving reasonably priced comfort food, and a lively bar on the premises. Mixed female and male dorm rooms have shared baths. For upscale wining and dining, reserve a linen-topped table at 275 Main, the Pitcher Inn’s signature restaurant (see above). Start with appetizers like seared scallops on a parsnip potato cake or duck confit risotto, followed by a perfectly grilled veal rib chop or chipotle braised lamb shank. Let Ari Sadri, general manager and sommelier extraordinaire, select the wine from his 400-bin cellar. The longstanding Chez Henri (80 Sugarbush Village Drive, 802-583-2600, www.chezhenrisugarbush.com; most entrees $12-$32) is everything an Old World, country-style bistro should be: cozy and low-slung, with faded decor, a log-burning fireplace, and candlelit tables. Stick with the traditional fare, such as French onion soup, steak frites, and fondue. Housed in a 19th-century barn, The Common Man (3209 German Flats Road, 802-583-2800, www.commonmanrestaurant.com, entrees $19-$34) rarely disappoints with its polished cuisine. The smallish, seasonally changing menu features straightforward dishes like the house-made duck sausage with kale, roast chicken with fennel and mushrooms, and New York strip served with parsnip custard and crispy rosemary potatoes. The Warren Store is a great place to pick up local products. Spring skiing is tops at Sugarbush (1840 Sugarbush Access Road, 802-583-6300, www.sugarbush.com) with six peaks, two base areas, 111 trails, and 2,000 acres of backcountry terrain. The resort also offers snowshoeing, ice skating, cross-country skiing, and ice fishing excursions. 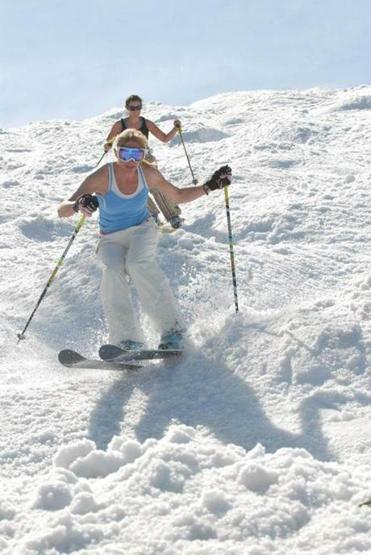 During warmer months, there are scenic lift rides, tennis, golf, mountain biking, and ziplining. Hiking opportunities are nearly limitless in this area with quick access to the Long and Catamount trails and Mad River Recreation Path. Spring is a roily time to get on the Mad River; Clearwater Sports (4147 Main St., Waitsfield, 802-496-2708, www.clearwatersports.com; $80) offers guided river trips. Or, bring your mountain bikes to explore the extensive network of single track and miles of backcountry roads. Sugarbush offers lift-service biking and guided excursions. Mad River Riders, the local bike club (www.madriverriders.com), has maps and trail descriptions of nearby rides. 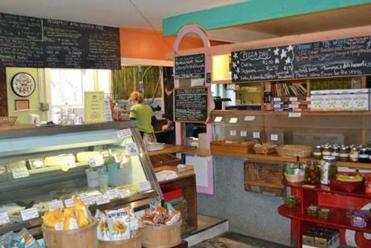 Before you leave town, be sure to stop by the Warren Store (284 Main St., 802-496-3864, www.warrenstore.com), a great place to pick up local products and a deli sandwich to go. We like it best on Sunday morning, when we grab the paper, a just-out-of-the-oven pastry, and a seat near the potbelly stove. Expect the slightly dive-y, slopeside Castlerock Pub (1840 Sugarbush Access Road, 802-583-6594) to be packed. Locals go for the scene, live bands on Saturday night, and the pub’s decent selection of Vermont craft beers. A young, sometimes raucous, weekend crowd hangs at Slidebrook Tavern (3180 German Flats Road, 802-583-2202, www.slidebrooklodge.com) to hear local and touring bands on Friday and Saturday nights. Typical bar fare is available to help soak up the strong drinks. Sugarbush offers Cabin Cat dining adventures (802-583-6590, www.sugarbush.com/outdoor-adventures/groomerrides; $175); ride a snowcat to remote Allyn’s Cabin for a four-course, fireside meal, and ski down the starlit slopes, or ride the cat back down — your choice. Diane Bair and Pamela Wright can be reached at bairwright@earthlink.net.